If you live in Spain and play golf or you are planning a visit to Spain for a golf holiday, you will find that this guide provides essential information on golf insurance in Spain. Spain is one of the most developed countries in Europe for golf courses with the Costa del Sol also known as the Costa del Golf, there are so many courses and developments built or being built. Many golfers do not understand the risks involved in playing a round of golf. An enjoyable sport played for pleasure and relaxation can turn into a very stressful situation which could result in a huge financial loss as a result of injuring another person while playing. What Does Golf Insurance Cover? Theft of clubs or damage – golf clubs can be extremely expensive and are vulnerable when they are out of your sight when perhaps with a caddy or being stored at the golf club. Hole in one expenses – If you happen to have a hole-in-one when playing golf, tradition dictates that you have to buy everybody a round of drinks in the clubhouse when you finish playing. This can be extremely expensive and unexpected! Third-party liability insurance – the most important protection is against the potentially huge expense of injuring another person, primarily by hitting them with your golf ball. This might be completely accidental of course but nevertheless you could potentially be sued and claimed against in court. Golf insurance will include cover for personal accident, death and permanent disability. Medical care is also covered for both the golfer and the caddy. How to Find the Cheapest Golf Insurance? We cannot recommend one company alone. Instead we suggest shopping around because quotations vary from company to company depending on your equipment to be insured and your age. What is the cheapest price? Who provides Spanish golf insurance? What does golf insurance cover me for? What happens if my golf ball hits another golfer? Does my current golf insurance policy cover me for playing in Spain? We found the cheapest premiums to be starting from €75 per year. Most likely, although this does depend on the value of your equipment, you will get a policy for between €100 and €150 annually. We suggest a combination of approaching a number of different insurance brokers who will do the hard work for you in price comparing different companies. You can also go on to the Internet and search companies to provide golf insurance in Spain but there are not many and insurance brokers will probably have access to better deals than you can find yourself. Insurance for golf is quite a specialised area but most of the major insurance brokers who provide insurance for cars and homes, will also provide quotations for golf insurance. The brokers that we list below provide service in English so you will fully understand what is included and what is not included in each policy. 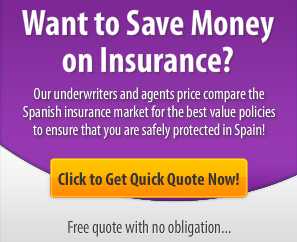 Which Spanish Insurance Companies Provide Golf Insurance? Liberty Insurance (Liberty Seguros) now no longer offer golf insurance. If you know of any other companies offering golf insurance, please let us know and we will list them above. Spain has only just recently developed price comparison websites for car insurance and home insurance so unfortunately golf is not covered on these websites at the moment but hopefully this situation will change in future. This should be the case because Spain is one of the top European countries for playing golf with many top courses such as La Manga. The legal/privacy bit we have to put in – Note that you are using this form to submit your details to us so we can then compare the market and give you options for golf insurance. Our privacy notice at the footer of our website lets you know how we use your data and how to request removal. You don’t need to do anything other than fill in your details and let our brokers do the rest.